A roasted turkey, with its body cavity filled with a mixture of ingredients that were inside it during the roasting. There is some dispute — well, variation in local usage, about which some people feel proprietary — as to what this mixture is called: stuffing (which is pretty transparent semantically) and dressing (which is puzzling) are the most common alternatives, but some Pennsylvania Dutch folk favor filling (pretty semantically transparent again). But matters are more complicated, since some things called stuffing are used as side dishes, not stuffed into anything. Then there’s the puzzle of dressing, which turns out to have a surprising etymology, one that connects it to the piece of women’s clothing the dress. Stuffing, dressing or filling is an edible substance or mixture, often a starch, used to fill a cavity in another food item while cooking. Many foods may be stuffed, including eggs, poultry, seafood, mammals, and vegetables. Turkey stuffing often consists of dried bread, in the form of croutons or cubes, with onion, celery, salt, pepper, and other spices and herbs such as summer savoury, sage, or a mixture like poultry seasoning. Giblets are often used. … In addition to stuffing the body cavity of animals, including birds, fish, and mammals, various cuts of meat may be stuffed after they have been deboned or a pouch has been cut into them. Popular recipes include stuffed chicken legs, stuffed pork chops, stuffed breast of veal, as well as the traditional holiday stuffed turkey or goose..
… The stuffing mixture may be cooked separately and served as a side dish, in which case it may still be called “stuffing”, or in some regions, such as the Southern US, “dressing”. On that last point: as I noted in a 10/24/14 posting, with a substantial section on the commercial product Stove Top Stuffing, that product is frequently used as a side dish. 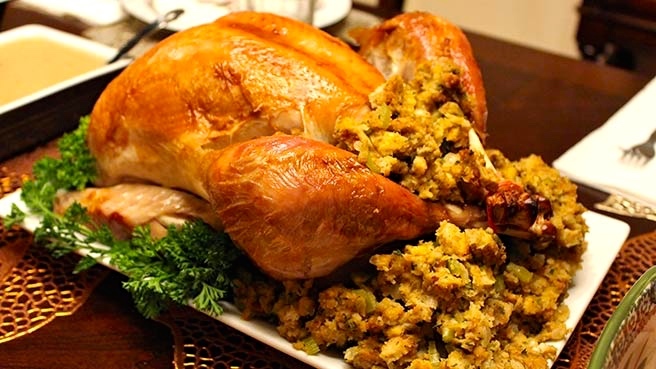 In addition, many people recommend not roasting a turkey with stuffing inside, but instead cooking it separately (in which case, it’s certainly dressing, not technically stuffing) and putting it inside the cooked turkey at the end of its roasting (to collect tasty juices) — a practice that can help avoiding overcooking the bird when it’s roasted with a stuffing inside. 1 a mixture used to stuff poultry or meat before cooking. 2 padding used to stuff cushions, furniture, or soft toys. – a piece of material used to fill a cavity in a tooth: a gold filling. – an edible substance placed between the layers of a sandwich, cake, or other foodstuff: a Swiss roll with a chocolate filling. 1 (also salad dressing) a sauce for salads, typically one consisting of oil and vinegar mixed together with herbs or other flavorings: vinaigrette dressing. – N. Amer. stuffing: turkey with apple dressing. 2 a piece of material placed on a wound to protect it: an antiseptic dressing. 3 size or stiffening used in the finishing of fabrics. 4 a fertilizing substance such as compost or manure spread over or plowed into land. – clean, treat, or apply a dressing to (a wound). – clean and prepare (food, especially poultry or shellfish) for cooking or eating: (as adj. dressed) : dressed crab. – add a dressing to (a salad). – apply a fertilizing substance to (a field, garden, or plant). – complete the preparation or manufacture of (leather or fabric) by treating its surface in some way. – smooth the surface of (stone): (as adj. dressed): a tower built of dressed stone. – arrange or style (one’s own or someone else’s hair), especially in an elaborate way. plus many of the senses in part 2 of the NOAD2 entry, cropping up in Middle English. The verb radiated in innumerable directions in Middle English, with astounding speed, in a way that makes it hard to see what, say, putting dressing on a salad, smoothing stone, and hairdressing could possibly have to do with one another, not to mention putting one’s clothes on. (Surely modern speakers just see these as different verbs.) The sense in ‘to stuff a turkey’ (or, for that matter, a mushroom) appears even later, in North America. The women’s-garment sense of the noun seems to be even more recent, probably 20th century, since the unrevised OED2 doesn’t have it clearly distinguished from the general sense just above. a one-piece garment for a woman or girl that covers the body and extends down over the legs. The writer(s) of this entry wanted to distinguish the category (call it G) of garments at issue here from undergarments, but unfortumately outer garment is customarily used to label clothing that’s put on on top of things of category G — things like coats. There are three layers of garments to be distinguished here (underwear, ordinary clothes, and outerwear), but we don’t gave a generally recognized label for the middle category. This entry was posted on November 26, 2015 at 10:58 am and is filed under Categorization and Labeling, Holidays, Language and food, Lexical semantics, Names. You can follow any responses to this entry through the RSS 2.0 feed. You can leave a response, or trackback from your own site.